If you value a good deal, great sound, and are in need of well-implemented Google Assistant-integration, the JBL Link 300 has it all. The JBL Link 300 stands as an affordable competitor to Amazon’s Echo line and a fair alternative to the variety of Google-branded products. Its unassuming design camouflages into any office, den, or kitchen space. Though it may not be quite as loud as the Google Home Max, it offers a comparable sound and takes up less space. Oh, yeah, it’s also $200 cheaper than the Home Max smart speaker. Anyone looking to transform their house into a smart home. JBL’s Link 300 is effectively a smaller Google Home Max that performs exceptionally well. Home cooks (and bakers): As a frequent baker, no longer having to constantly wash my hands to skip a song is liberating. The Link 300 accurately picks up on voices, even when spoken at a below-average volume. Plus, Google is able to read recipes and break them down step-by-step. Who needs to cook with friends anymore? Party hosts: This one has the caveat of “if your apartment is small enough.” As addressed in the sound section, the JBL Link 300 fills my apartment with sound and is heard over typical party din. What’s the JBL Link 300 like? Rear-facing, the passive radiator produces emphasized bass without hindering the midrange frequencies. The integrated Google Assistant is responsive enough to render the physical controls null. One look at the JBL Link 300 and you know that it’s intended for indoor use. Though the plain appearance may border on the edge of drab, the benefit of this is that it fits in almost anywhere. The fabric grille adds a stylized touch and houses a passive radiator—similar to those on the JBL Charge 3—that responds to vibrations from the two-way speaker system, which intelligently transmits the appropriate frequencies to the woofer and tweeter, respectively. The front of the JBL Link 300 is minimally decorated with centered branding; beneath that is an LED indicator, denoting WiFi connectivity and strength. Centered below the lip of the top panel are four circular LEDs that indicate volume level and blink in unison when voice commands are made. Moving on up to the main panel are rubberized controls, which initiate Bluetooth pairing, microphone toggling, Google Assistant access, volume adjustment, and playback control. Parallel to the controls are two offset microphones for far-field voice recognition. This technology allows users to make inquiries or commands from across the room. When speaking just above a whispering volume, the microphones register commands from a 25-foot distance. If media volume hovers at two-thirds or above, users will have to raise their voices to be heard and recognition falters. In a week of testing, only one instance warranted a manual reset: Google Assistant kept running across an unnamed glitch that hindered command recognition. Generally though, this sensitivity comes in handy during uninterrupted domestic upkeep and for those who find themselves couch-locked. The JBL Link 300 is a stationary speaker requiring a constant 3A power source. That’s right, the Link 300 is Bluetooth and WiFi-enabled only and compatible with both 2.4GHz and 5Ghz networks, facilitating snappy Google Assistant-response. It operates via Bluetooth 4.2, which is great, but its size and 3.8-pound weight make it a chore to move around. In the recessed region of the rubberized footing are two ports, one for the 3A power adapter and a micro-USB input for servicing the speaker. Speaking of the power adapter, like most of us, the JBL Link 300 is stationary. Transplanting from one room to another requires moving the power brick, as it relies solely on external power. Occasionally, Google Assistant is rendered unresponsive, requiring a manual reset via the bottom button. This is easy enough to fix and only takes a few seconds. Also, the JBL Link 300 isn’t compatible with the aptX Bluetooth codec. Audio-visual lag is painfully present and results in a one or two second delay. But, hey, at least the smart speaker supports WAV, AAC, and FLAC files. Also—though it seldom happens—music sporadically stutters, even on a 5GHz network. This is a rare enough occurrence that users shouldn’t find themselves too aggravated by it. Like frosted tips of the ‘90s, virtual assistant-integration is all the rage, and JBL antes up with the Link 300. With Google Assistant built-in, asking questions, getting directions, and controlling music is a hands-free breeze. Setup is just as easy and mirrors that of any Google-branded smart speaker. Simply download the Google Home app and follow the step-by-step, whimsically illustrated instructions. After initializing, the JBL Link 300 registers as a Google Cast device, letting users stream music, podcasts, or radio directly from a phone to the speaker. When navigating the Google Home app, users can control multi-room playback across speakers with Chromecast built-in, and being a WiFi-enabled device allows for high quality, 24 bit/96kHz streaming. Of course, if your WiFi goes rogue, the JBL Link 300 can always fall back on plebeian Bluetooth streaming from the source device. Just like the Google Home and Google Home Max, the Link 300 can provide easy-to-share information such as weather, traffic, recipes, and so on. Additionally, users can natively use voice-control for Google Play, YouTube, Spotify, and Pandora. As one may expect, voice-control isn’t compatible with iTunes or Amazon music. The JBL Link 300 can stream music over a 2.4GHz or 5GHz network, making the streaming process and accessing Google Assistant a breeze. Additionally, homes that are decked out with smart-products, like thermostats and lighting, can be controlled via the Link 300. Oddly enough, though the far-field mics are great at picking up voices, the speaker doesn’t have a speakerphone mode for calls. This isn’t a huge issue, rather, an odd omission. But how does it compare to Alexa? For one, Google Assistant isn’t gendered the way Alexa is, but anthropomorphism aside, Google Assistant tends to interpret colloquialisms more effectively than Alexa; though, the gap is closing. That said, points to Amazon Alexa for allowing a greater breadth of options with third-party devices and apps. Also, though Google can now readout recipes step-by-step—among other actions—Alexa is still ahead when it comes to controlling smart home products. Homes with a plethora of third-party smart home gadgets will benefit from Amazon Alexa, as it offers greater compatibility with controlling those products. JBL speakers are some of the most reputable in the consumer market, just look at the success of the Flip and Charge lines. The company—a subsidiary of Harman International Industries—knows how to engineer high quality products at a reasonable price. The Link 300 fills my 750-square-foot apartment with ease, making it great for parties. Maxing out the volume for an extended period of time, however, would likely warrant an eviction. JBL’s Link 300 is inoffensively designed, allowing it to blend in almost anywhere. The passive radiator is a pretty thing and a functional one, too. Kendrick Lamar’s “All the Stars” relies on a strong low-end, and the Link 300 meets this demand. Sub-bass is slightly attenuated at the benefit of clarity; bass presence never distorts vocals or detracts from the treble, even at maximum volume. Rhythmic drums are easy to separate from the constant, synth-beat, which is easy to differentiate from Lamar and SZA’s vocals, making the soundstage quite good for a speaker this size. At 97 bpm, the chorus maintains the overarching beat, which gives way to SZA’s powerful, diaphragm-engaging vocals. The only portion of “All the Stars” where masking by the JBL Link 300 is present can be heard at 1:45. Bridging the verse and chorus, auto-tuned vocals are underemphasized compared to the low-end. The tweeter effectively handles the treble, affording it proper emphasis without sibilance. 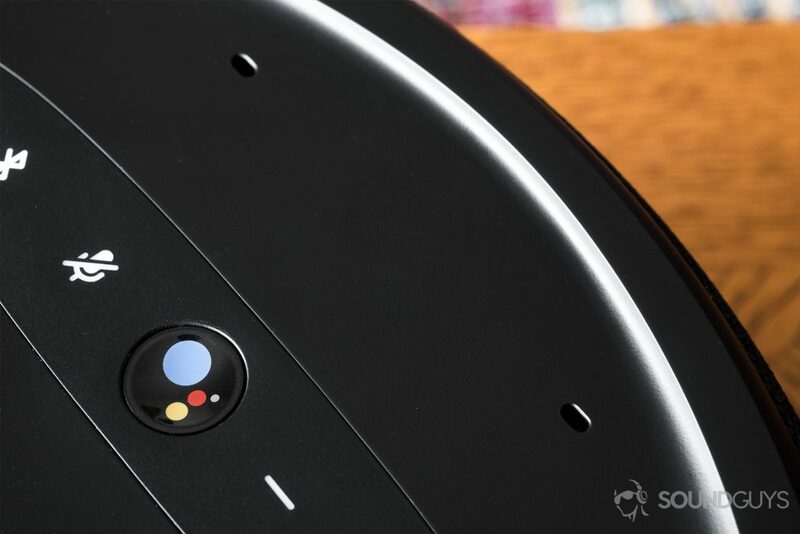 On the bottom of the Google Assistant-integrated speaker is a recessed region that houses two ports: one for the power input and a micro-USB port for servicing the speaker. Next to that is a reset button, which comes in handy when Google Assistant runs across an error. Outside: Unlike the IPX7-rated JBL Clip 2, the Link 300 lacks water-resistance, inducing apprehension when used outdoors in the spring, summer, fall… and winter. That said, it sounds good, but higher frequencies are masked by extraneous noise (see: the never-ending construction by my apartment). To combat this, cranking up the volume helps, but then you run into the whole “disrupting the peace” thing. Small rooms: When using in a single, non-communal room, the speakers get even louder, since the enclosure is more compact. This is both good and bad. The volume boost is nice, but you experience the same issue as taking it outside: masked treble. Setting up the JBL Link 300 is just like any Google Home or other Google Assistant-integrated product. The Google Home app walks users through the initialization process. Absolutely. Affordability and quality audio should never be mutually exclusive and JBL walks the walk with the Link 300. This smart speaker is a great alternative to the Google Home for people already invested in the Google ecosystem. I’m floored by the dual microphone, far-field system and its ability to recognize voices from a distance without requiring shouting. Also, Google Assistant is supremely helpful when it comes to looking up directions, recipes, and perusing your music library. The only reason that one should opt for the Google Home Max is if eardrum-crushing volumes are a top priority. Otherwise, save a good $200 and go with the JBL Link 300. It’s a user-friendly speaker that can be setup and set down without hassle, and its impeccable voice recognition and sound quality are a bargain for the price.